Microsoft seems develop some new business, actually it just enlarge original one, Microsoft Live is not a new service but its interface is brand new, and layout looks cool. It contains some different Microsoft online services, and seems like another Microsoft Passport or instead of it. You can use its ID to sign in some different Microsoft online services, such as Hotmail, MSN, Live. Now, it has another new company that call Mesh. 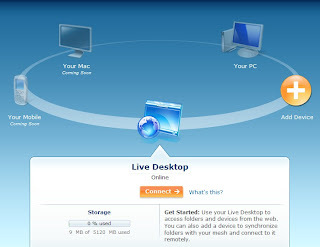 This is an online virtual desktop, similar with another one that I posted G.ho.st, or other like Desktop Two, Mygoya. Usually, that kind of stuff combine some different services, like online storage, email, calendar, news, RSS reader, note, or other. Mesh seems like only one interest that is online storage, it allows you can add other kind devices, and that will synchronizing together. If you have Live ID you can use it to sign in with Mesh. Of course, it is free.